Audi can provide new and used car financing for all Audis. Stop in today and take advantage of our financing deals for the Audi A3, A4, Q5 and any other models we sell. Whether you are new to the country, or just new to buying/leasing a new car, Audi offers the tools and information you need to make the most of your Audi experience. Competitive rates, flexible terms, convenient payment options – just a few of the many benefits you’ll enjoy when you finance through Audi Financial Services. We’re committed to assisting you throughout the course of your purchase or lease. My First Audi customers can choose from a wide range of financing, leasing and insurance products at Audi. Our professional Financial Service managers can help you obtain the credit you deserve. We also have first-time-buyers programs for those of you that currently have no credit established. At Audi, we are committed to helping you whether you are a Student, new to the country, or just new to Audi. 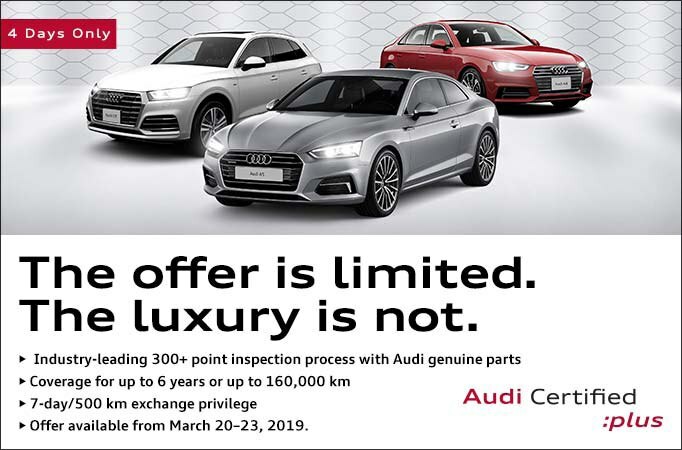 Call us at 416-961-2834, or email us at info@audidowntowntoronto.ca today.